Discover the official state emblems of Victoria: Leadbeater's Possum, the Helmeted Honeyeater, the Common Seadragon, Common Heath, our state mineral, gold and our state tartan. 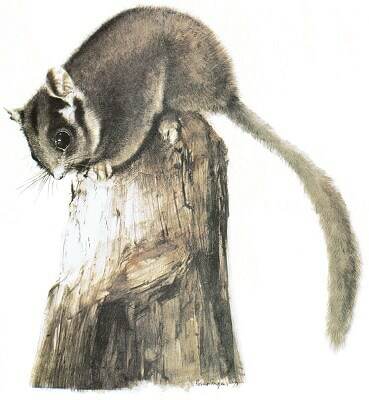 The scientific name of Leadbeater's possum is Gymnobelideus leadbeateri. They are about 40cm long from nose to tail tip. Their tails account for half their length. Soft, dense fur covers their body. It's longer on the club-shaped tail. They are dark greyish-brown with whitish underparts. The face has distinctive markings. Unlike some of the possums close to its size, it doesn't have any gliding membrane. It's a nimble species, which jumps around from branch to branch. It feeds on insects living on the foliage and under the bark of eucalyptus, honey-dew from insects and some sap and gum. Leadbeater's possum breeds from February to November. It produces 1 to 2 young per litter. It is only found in the mountain ash forests of the Victorian central highlands, from Healesville and Marysville to Mt. Baw Baw. Find out more about the Leadbeater's Possum. The scientific name of the helmeted honeyeater is Lichenostomus melanops cassidix. 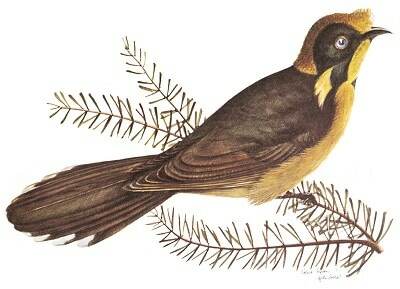 It's an endangered subspecies of the yellow-tufted honeyeater. They are about 20cm in length. The the upper parts of the body are olive-grey. Their outer wing and tail feathers are greenish-yellow. Their underparts are yellowish-green with dark streaks. The sides of their heads are glossy black with golden ear-tufts and a yellow throat. Both crown and forehead are golden yellow. The forehead feathers jut over the base of the bill and make a helmet shape. It lives in a small area on Woori Yallock Creek near Yellingbo on the outskirts of Melbourne. The Yellingbo State Wildlife Reserve was established to protect the few remaining colonies. The helmeted honeyeater is vulnerable to habitat disturbance due to the diverse environment it needs to breed and thrive. Find out more about the Helmeted Honeyeater. The common seadragon is also known by the name weedy seadragon. Its scientific name is Phyllopteryx taeniolatus. It is a member of the Syngnathidae family. It's related to seahorses, pipehorses and pipefish. It became Victoria's official marine emblem by public nomination in 2002. Common seadragons like to live near kelp, sea grass beds and in kelp forests on offshore reefs. 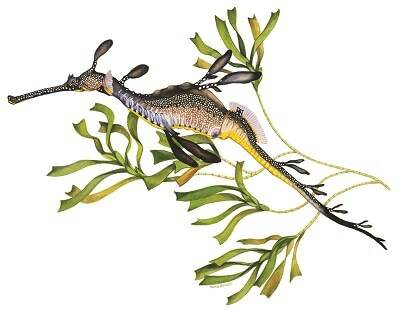 Read about the Common Seadragon on the Australian Museum website. The scientific name of the common heath is Epacris impressa. It is a member of the Epacridaceae family. It's related to many other heaths. The pink common heath became Victoria's official floral emblem in 1958. Victoria was the first Australian state to officially recognise such an emblem. It's included on Victoria’s coat of arms. Victoria is the second-largest gold producer in Australia. Gold was first discovered in Victoria in 1850. The Victorian gold rush started when it was discoved in Ballarat in 1851. This led to mass immigration, wealth and development in Victoria. At its peak, up to two tonnes of gold per week flowed into the Treasury Building in Melbourne. Victoria is known for giant masses of gold, referred to as nuggets. The most famous nugget found in Victoria is the Welcome Stranger. Discovered in Victoria in 1869, it had a calculated weight of over 62 kilograms. 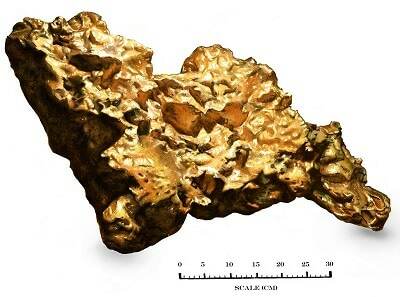 It was the largest discovered alluvial gold nugget in the world. Throughout history, gold has always been a valuable and sought-after precious metal. Its uses include coins, jewellery and other arts. It also has many practical uses in dentistry, electronics and other fields. In 2012 both Houses of Parliament recommended that gold be the first mineral emblem of Victoria. 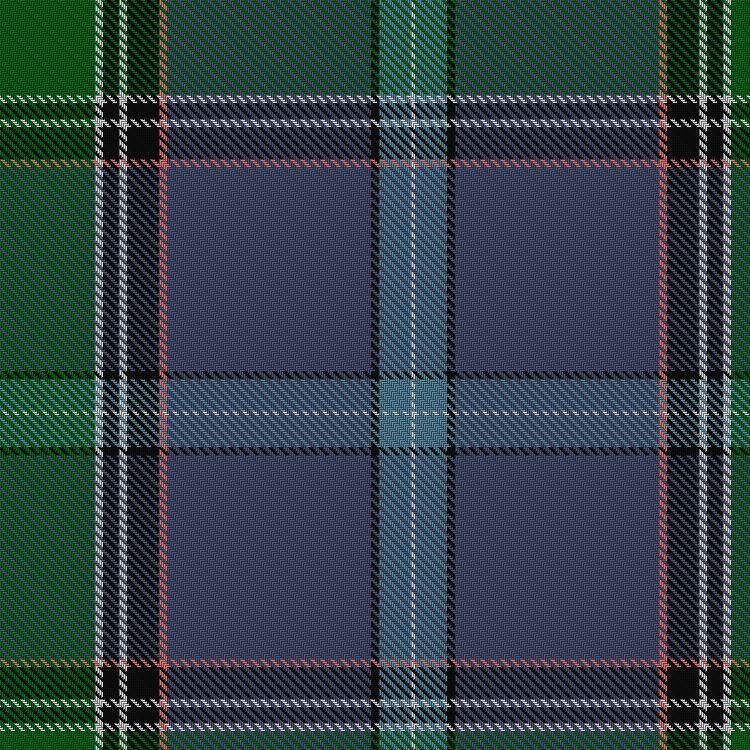 The colours of the Victorian State tartan are blue, white, green and pink. Blue represents the colours of the shield on the Victorian Coat of Arms and represents the background of the Eureka Stockade Flag. The 5 white lines on the State Tartan represent the 5 white stars of the Southern Cross. These appear on both the Victorian Coat of Arms and the Eureka Stockade Flag. Green represents the olive branch on the Victorian Coat of Arms. Pink represents the Victorian floral emblem, the common heath.